They clawed the upholstery, and when that was in shreds they started clawing the wood frame. They had scratching posts but never used them. Little did I know they were in the wrong place! I’ve learned a lot since then. These are the 10 best ways I’ve found to stop a cat from scratching furniture. 1. Put your cat’s scratching posts and pads in places that work for her, even if they don’t work perfectly for you. 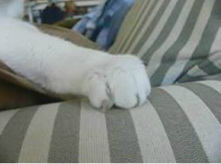 One of the reasons cats scratch furniture is to mark their territory visually and with the scent in their paw pads. You can usually stop a cat from scratching the furniture by putting scratching posts and pads at the entrances to the rooms the cat uses most. Another good place for a scratching post or pad is near where your cat likes to sleep. Cats love nothing more than a good stretch after a nap. 2. If your cat still insists on scratching the furniture, put her scratching post or pad right against the furniture she’s clawing. If you give her a surface she likes, she’ll prefer it to the upholstery, especially if it’s sprinkled with catnip. Tall, stable scratching posts covered with carpet or sisal. The post should be at least 33″ high so the cat can stretch all the muscles in her back and stable enough that the cat won’t feel like it’s going to topple over on her while she’s scratching. Wide honeycomb cardboard scratching pads. Wide scratching pads on an angle, like Imperial Cat’s Rub and Ramp . There are other inclined scratchers, but this one is very stable and won’t tip over. Carpet remnants or throw rugs, reverse side up. Secure them with duct tape or the leg of a table or chair. They won’t be fun to scratch if they keep moving around. Rattan and wicker. A wicker child’s chair or laundry hamper could make your cat very happy! Large cardboard cartons. They’re great for hiding, too. Put some tissue paper inside and sprinkle catnip on it. 4. If your cat is scratching the carpeting, put a coir (coco fiber) doormat or carpet squares on the floor in her location of choice. She’ll be able to scratch in her favorite location without damaging your rugs. 5. Put Soft Claws plastic nail caps on the cat’s claws. Although they won’t stop a cat from scratching the furniture, they will keep her from damaging it. 6. Put Sticky Paws or double stick tape on furniture the cat is scratching. The sticky feeling is unpleasant underfoot and stops a cat from scratching the furniture. 7. Place bubble wrap on chair cushions, the backs of chairs and other places where the cat is scratching. The bubbles popping will startle the cat and discourage her from scratching there. 8. Put vinyl carpet runner, bumpy side up, on your furniture. She won’t like the feeling underfoot, and cats can’t claw vinyl! 9. Use an electronic deterrent, like a ScatMat , on chair and sofa cushions, arms and backs. The cat won’t like the tingling sensation underfoot and will stay away. 10.Keep your cat’s nails trimmed. She’ll be more comfortable and will do less damage if her nails are short. Here’s a video on how to trim your cat’s nails. How do you get a cat to use a scratching post? Find out how and see posts we recommend. Please don’t declaw your cat!Declawing can cause many more problems than it solves. Learn about declawing.